In the frontal test, the passenger compartment remained stable. Protection of the driver's chest was better than the original assessment and its marginal rating is an improvement over the weak performance seen last time. Dummy readings showed good protection of the knees and femurs of the front seat occupants. However, the steering column and ignition barrel presented a risk of injury to the driver's femurs. The modifications made to the car do not influence side impact performance and the results are unchanged from the original assessment. In the side barrier impact, the Venga scored maximum points. In the more severe side pole test, dummy readings indicated marginal protection of the chest and good protection of other parts of the body. Protection of the neck against whiplash injuries in a rear-end impact was good. In the original assessment, the 3 year dummy contacted the C-pillar trim on rebound. No such contact occurred this time: forward movement of the dummy, sat in a forward facing restraint, was not excessive and the rebound was well controlled. In the side barrier impact, both dummies were properly contained by their respective restraints. The passenger airbag can be disabled to allow a rearward facing child restraint to be used in that seating position. Clear information is provided to the driver regarding the status of the airbag and the system was rewarded by Euro NCAP. A permanent label warns clearly of the risks of using a rearward facing restraint in the front passenger seat without first disabling the airbag. Electronic Stability Control (ESC) is an option on one variant of the Venga in four European countries; otherwise, it is standard equipment. As it is to be fitted as standard in the great majority of sales, it has been included in Euro NCAP's assessment of the car. A driver-set speed limitation device is available as an option but it did not qualify for assessment as it is not standard on any variant. A seatbelt reminder system is standard equipment for the driver and front passenger seats. When the Venga was originally tested at the beginning of 2010, Euro NCAP identified some weaknesses in its performance, especially in the frontal impact, and the car was awarded four stars. 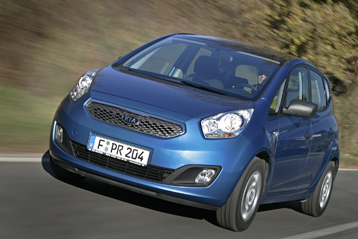 Kia were not satisfied with the car's performance and have introduced a range of improvements: structural changes help reduce rotation of the vehicle in the frontal impact; the restraint system has been refined to reduce chest and femur loads; the rear seat has been slightly modified to improve child restraint performance; and the changes made following the original test to minimise the risk of the seatbelt being cut during the test have continued in production since that time.